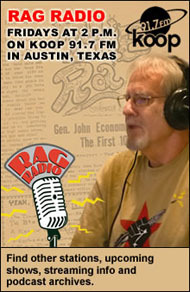 We ‘Celebrate The Rag’ & it’s lasting impact on our city at the Austin History Center, Sunday, Feb. 19. 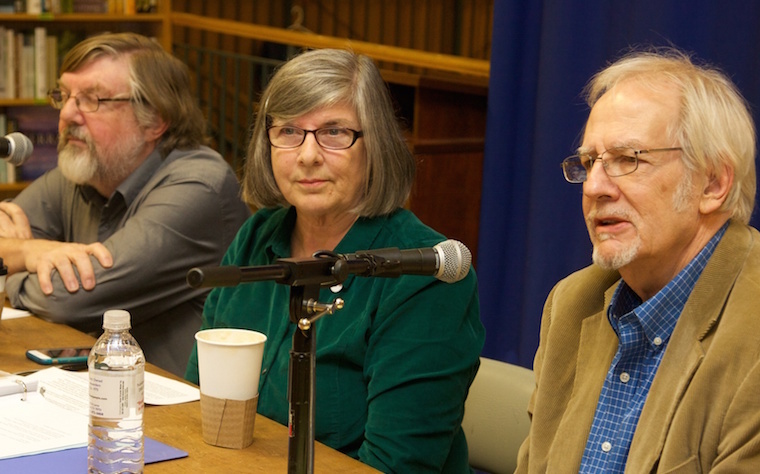 From left: Richard Croxdale, Alice Embree, and Thorne Dreyer, editors of Celebrating The Rag. Photo by Alan Pogue / The Rag Blog. 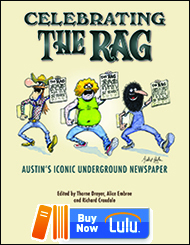 AUSTIN — The Austin History Center is “Celebrating The Rag” with a big event on Sunday, February 19, 2017, from 2-4 p.m. And everyone’s invited! 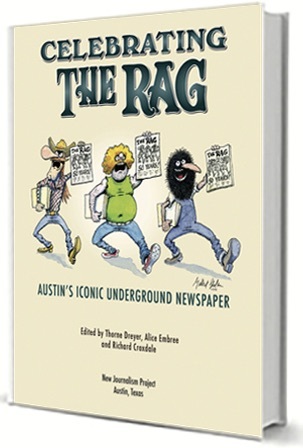 Thorne Dreyer, Alice Embree, and Richard Croxdale, editors of the acclaimed new book, Celebrating The Rag: Austin’s Iconic Underground Newspaper, will speak and lead a discussion. And they will sign copies of the book. 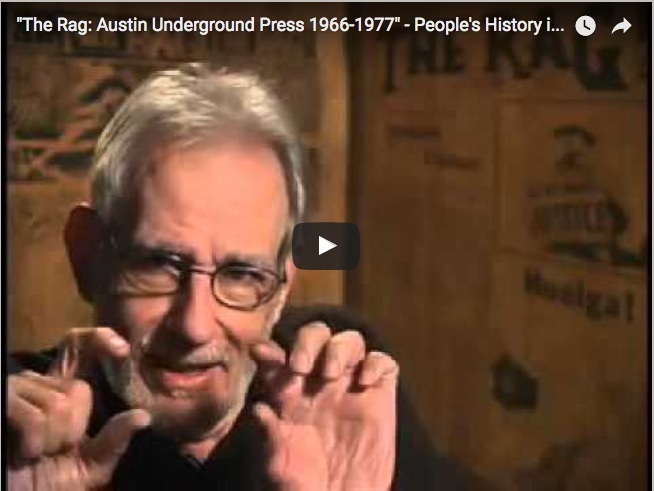 Glenn Scott of People’s History in Texas will sneak preview screening of the new documentary film, The Rag: Austin Underground Press 1966-1977, that tells the history of the legendary underground newspaper that helped make Austin weird. Books will be available for purchase. And there will be refreshments! The Austin History Center (AHC), which is part of the Austin Public Library system, is located at 810 Guadalupe St. in downtown Austin. 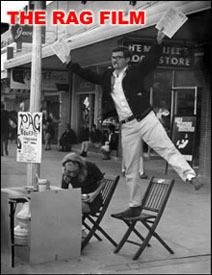 The Rag celebrated the 50th anniversary of its founding with a four-day, multi-venue series of events in October 1969. Screen grab from the Rag movie. Thorne Dreyer was the original “funnel” of The Rag in 1966. He now edits The Rag Blog and hosts the syndicated Rag Radio program. Austin activist Alice Embree, a veteran of the women’s movement and progressive politics, worked with the paper through much of its history. Richard Croxdale and Glenn Scott, who were on the Rag staff in the paper’s later years, are film producers with People’s History in Texas. They made the documentary film about The Rag. 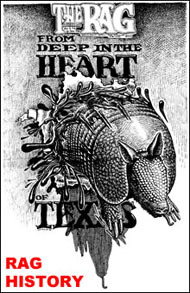 This entry was posted in Metro and tagged Alice Embree, Austin History, Austin History Center, Celebrating The Rag, Glenn Scott, Metro Event, People's History in Texas, Richard Croxdale, The Rag, Thorne Dreyer, Underground Press. Bookmark the permalink.